Nichology : Singapore Class - So What Exactly Is It? Singapore Class - So What Exactly Is It? 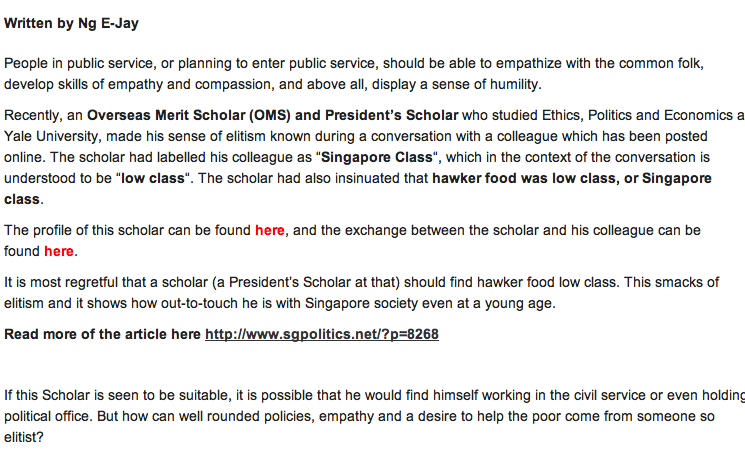 My Paper published an article on 16 April 2013 - "Is Singapore Class an insult?". Honestly, "Singapore Class" can refer to many things, but in this case, the conversation between DC* and me has clearly shown that he referred to "Singapore Class" as a class lower than himself. While others were quick to point fingers at me, with comments that i am being petty, too sensitive and showing signs of inferiority complex, i would like to clarify once again that the post was not written with the intention to gain sympathy as if i was a victim of someone trying to specifically degrade me. Instead, what i clearly wanted to put through was the point about DC* creating a class labelled as "Singapore Class" when there clearly should not be any class differentiation in Singapore among Singaporeans - we are all equal. The post was also not written with an intention to put DC* down or make any defamatory accusations about him. I never intended for it to go viral even though i am a blogger of sort, but netizens were quick to discuss this issue, which later caught the attention of the mainstream media. I was asked by DC* on Monday, 15 April 2013 to retract my post, which i politely declined to. During the persuasion period, i asked DC* what exactly was "Singapore Class", to which he evaded the question, again. Prior to that, no apology was given pertaining to this issue. I would like to believe that his main concern was for me to retract the post. I would also like to highlight that because this issue has been widely discussed among forums and on websites, i do not have control over what has been posted on other sites. As My Paper reported - "Some netizens who took offence at the term "Singapore Class" flamed DC on the Hardwarezone thread, and even posted his personal particulars. " This incident has taught me that one should not be quick to shoot his mouth off. Such untactful comments made by DC* creating a different class between Singaporeans was uncalled for, especially from someone with such high education standards. I would like to specifically re-quote what Dr William Wan, general secretary of the Singapore Kindness Movement, said "We should be more sensitive and respectful of one another." Another thing i learnt is the new term "Singapore Class", which so unfortunately i (or if i may say we) will never know the real meaning behind those words. hi. much as i think that comment might have been very insensitive (i actually thought singapore class referred to restaurants the first time i read it), can i ask why you are so intent on this character assassination? Hello, I found the link to this blog after reading a response written by someone to your blog post. He had copied the conversation you had with DC and initially because I didn't know your name, and didn't know you were the blogger, I was under the impression that Nicholas was the person you were annoyed at for saying that Singapore hawker food was not classy enough to be in a food blog. And I thought DC was trying to make the point that you are still Singaporean at the end of the day. So really, if you had not written that whole interpretation of what you perceived his comment to be, it wouldn't sound like there's anything malicious or arrogant about that comment. Maybe you just took it the wrong way. And now it's been blown up too much for you to just admit that maybe you misinterpreting things without losing some credibility as a blogger? I have seen David Chan Tar Wei in school before, he comes off to be as someone snobbish and proud. Hence i am not surprised he deserved it.